Take a look at the following notice of assessment for a property located in South Fulton County, Georgia. In the red, highlighted area is the estimated city tax for South Fulton, Georgia. There is, however, one problem. There is no city of South Fulton. Sixty-six square miles of land in South Fulton County, Georgia remains unincorporated. 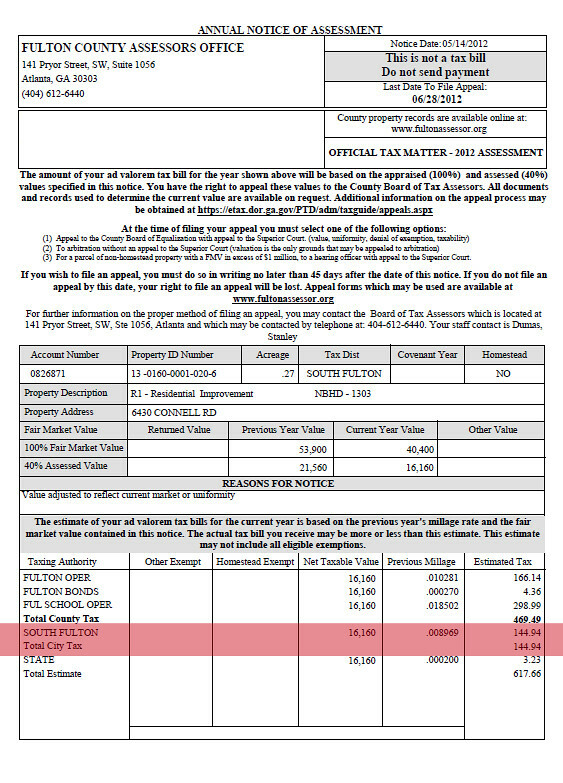 But as the 2012 notice of assessment from the Fulton County Board of Assessors shows, unincorporated South Fulton is paying city taxes. So how is South Fulton, the city that isn't a city, governed? The Fulton County Commission governs South Fulton. Seven county commissioners, representing all of Fulton County, govern South Fulton. Commissioner Liz Hausmann, for example, lives in north Fulton, but makes decisions concerning police coverage in South Fulton. Another Commissioner, Tom Lowe, also lives in north Fulton, and he decides what businesses operate in South Fulton. Commissioner Robb Pitts lives in Buckhead. He's deciding where, when, and how many parks are built in South Fulton. Commissioner Joan Garner lives in Atlanta, near the Sweet Auburn District. Commissioner Garner makes decisions about the fire department in South Fulton. I'll reiterate, South Fulton County is taxed like a city. All these county commissioners from Buckhead, Atlanta, Sandy Springs, and Johns Creek decide taxation in South Fulton County. All these county commissioners, who do not live in South Fulton County, govern South Fulton County. It is, in essence, taxation without representation. Our great nation was founded on a series of principles. One such principle is that there should be no taxation without representation; that only Americans should tax Americans. Only Americans should govern Americans. Likewise, only residents of South Fulton should tax residents of South Fulton. Only residents of South Fulton should govern South Fulton.